The global economy remains precarious. Growth is expected to moderate in the near-term before picking up on the back of Chinese stimulus, gradually receding volatilities in emerging markets, and fading short-term drags on the eurozone. But downside risks still loom with little room for policy mishaps. 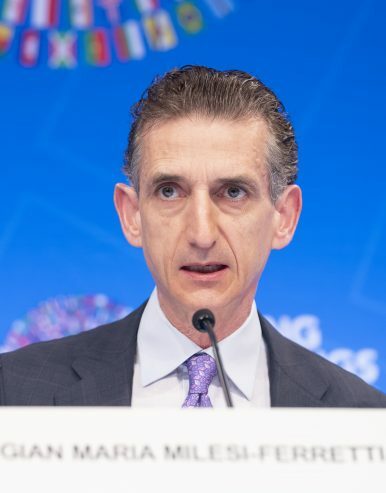 Gian Maria Milesi-Ferretti, a director of research at the IMF and co-editor of the World Economic Outlook (WEO), says that a pause in U.S. interest rates hikes helps to improve global market sentiment, especially in economies more sensitive to tight external financial conditions. In this interview, he discusses his outlook on global growth. Maurits Elen: What explains the growth hiccup in 2019? Milesi-Ferretti: The global economy has slowed in late 2018 and early 2019 due to a combination of factors: a slowdown in China, driven by the deleveraging process and also trade tensions; severe macroeconomic distress in a number of emerging economies, such as Argentina and Turkey but also Iran and Venezuela; a sharp slowdown in the euro area, driven in part by temporary disruptions to car production in Germany. Some of these factors will gradually wane and policy support (fiscal stimulus in China, more accommodative monetary policy in the U.S. and the euro area) is forecast to help growth recover later in 2019 and in 2020. What sources of risk have become more pronounced since January? Financial markets have turned more optimistic but there are many sources of uncertainty, including Brexit but also continuing trade tensions, which could worsen market sentiment down the road. The slowdown in manufacturing activity and trade could also prove to be more protracted, and the recovery in 2020 hinges on improving macroeconomic conditions in emerging economies under macroeconomic distress, which is subject to considerable uncertainty. Have global uncertainties strengthened the dollar’s safe haven status? The dollar retains a safe haven status. Indeed, it appreciated in late 2018, as market sentiment deteriorated, while it weakened somewhat in 2019, as confidence returned. There are many uncertainties surrounding the outlook for the global economy, ranging from trade tensions and geopolitical factors to financial vulnerabilities in a number of advanced economies as well as emerging market and developing economies. Is India on track to overtake China as global growth driver? China and India are important engines of world growth, with China expected to grow above 6 percent and India above 7 percent. But the Chinese economy is considerably larger than India (5 times larger at market exchange rates and 2.5 times larger at purchasing power parity) and hence has a more sizable impact on world growth. Are emerging markets converging with advanced economies in terms of GDP per capita? Yes, emerging markets are converging in the aggregate, as they are growing and forecast to grow considerably faster than advanced economies in per capita terms. The convergence is driven to an important extent by economies in emerging Asia, particularly China and India but also other countries, such as the ASEAN group and Bangladesh. However, there are many emerging and developing economies whose convergence prospects are much bleaker. Over 40 emerging and developing economies, with total population close to 1 billion, is forecast to grow more slowly than advanced economies in per capita terms over the next five years, and hence to fall further behind in terms of living standards. How meaningful is the pause of U.S. interest rates hikes for China and Japan? The announced pause in interest rates hikes by the U.S. Federal Reserve has contributed to improved global market sentiment, and particularly in those emerging and developing economies more vulnerable to tight external financial conditions. It may also reduce capital outflow pressures for China. The impact is more muted in countries such as Japan.